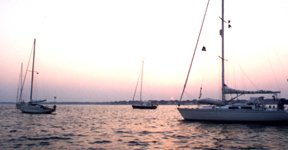 A fleet at rest at sunset in the lee of Sheffield Island. Sheffield Island is just the right distance and destination for an overnight cruise from just about anywhere in the Western Sound. It’s about a 2.5 hour sail for us, providing plenty of opportunity for time on the water, yet it is close enough to get everyone settled to enjoy the destination before sunset. It’s also close enough to Norwalk to facilitate shore leave, although being closer to the harbor entrance on a rough or busy boating day would be preferable. The approaches are pretty straightforward as long as you consult a good up-to-date chart. As opposed to Greenwich ’s off limits to non-residents policy at Captain Island , Norwalk welcomes visitors and even allows overnight camping with a permit. Sheffield light delights visitors with historical charm and vistas of New York City. The lighthouse on the island has been restored and has gone through interesting historical episodes. It was built to ward off unsuspecting ships of the treacherous approach to Norwalk . The Norwalk Seaport Association’s volunteers maintain the lighthouse and grounds as a museum and nature preserve. It is available for rent for special occasions, and private tours can be arranged for nominal cost. Once on the island, visitors are treated to a tour of the lighthouse, including a chance to climb up into the light tower itself, where on clear days, the New York City skyline can be seen. Unfortunately the light itself has been removed to make more room for visitors, which leaves a bit of the magic out. (Anyone up for a quest to find a replacement fresnel lens  Jimmy Buffet style?) The ten room lighthouse showcases period furniture, and offers a chance to see what life was like for the families of 19th century light keepers. Best of all, the keeper can often be coerced into spinning yarns about the lighthouse and its former inhabitants. And of course, there’s the annual Christmas in July celebration on the island where you can meet Santa in the off season. Another island attraction is the Nature Trail completed by the Seaport Association in cooperation with the U.S. Fish and Wildlife Service. From a viewing platform, a variety of wildlife including nesting herons and other birds can be observed. You can even find the ruined remains of a stately home that once graced the island. Most exciting is the newly established Norwalk Islands Canoe and Kayak Trail. 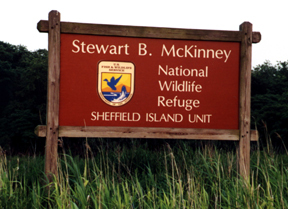 The trail leads you to Sheffield , Shea, and Grassy Islands . Boats may be launched from Calf Pasture Beach Boat Launch. Information on which islands are available for access is online. The preserve offers much wildlife for viewing. Of course, the anchorage at Sheffield is about as special as found on Long Island Sound. Well protected from the elements, easily navigable, with deep water almost right up to the beach, what else could one wish for? It’s ideal for a fleet or a lone weekend warrior. The choices for recreation once securely anchored include planned group festivities ashore, including a grand cookout for dinner. Waiting for a ride to Norwalk. Being so close to South Norwalk does offer some advantages for a second day of activities ashore. Not only is there a fabulous aquarium that is right on the waterfront, but the town literally reaches out to visitors with restaurants, shops, and all manner of entertainment. There is no shortage of shore leave activity, particularly if you happen upon the Harbor Splash and Dragon Boat Festival in June, the oyster festival in September, and in July, check out the kids programs including Pirate Week and Crabbin’ Days. There are a number of transient slips available at the visitors dock in Veterans Park ; it’s a short walk across the bridge into the SoNo historic district and a dinghy ride across to the Maritime Aquarium and IMAX theater but we weren’t able to find a dinghy dock to tie up to. The Connecticut tourism website has a great section on the Norwalk Islands, featuring kayaking and fishing. Click to view.